The 'Study Buddy', written with the aid of year 12 students, is a user-friendly approach to help high school students learn and manage home study. It is not the typical hard to understand study guide which usually has heaps of information that students find difficult to read, understand & use. The 'Study Buddy' takes no longer than 15 minutes to read from cover to cover and is designed to give students confidence to begin an intelligent and productive approach to home study and is one of the most popular study aids available. Remember about 70% of examination learning is done at home and many teachers often forget that students generally are not taught how to study efficiently and effectively at home. The 'Study Buddy' is an inexpensive, easy to understand 'kick start' for students who do not know where to begin. 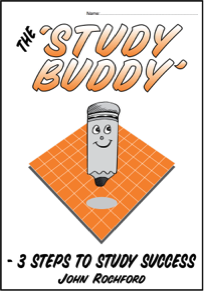 Many schools purchase the 'Study Buddy' for entire year groups and present them to students during study skills sessions/camps/retreats. 1. A question you must answer. 3. A quiz to test the efficiency of your present method of study. 4. Why do I have to study efficiently? 5. Why must I have a rigid and organised approach to study? 6. How much study should I do each week? 7. The three steps for effective study. 8. I now have a study timetable but how do I study effectively? 9. How to make user friendly study summaries? 10. The importance of exam technique - with tips! 11. Topic study register - an example. 12. Topic study register - blank tables for all subjects. 13. Study time tally sheet - with an example. 14. Example of a past student's study timetable. 15. A blank study timetable.